We are so excited to be participating in the ADORABLE National Children’s Contest! We have seen how adorable these kids can be around here! Contact us now to book your Adorable Session. The contest runs until May 31st, 2016. You may enter one photo per child per category. Each category has a 1st, 2nd, and 3rd place winner, and also 2 honorable mentions. First Place wins a $200 Mastercard gift card, 2nd place a $100 Mastercard gift card, 3rd place a $50 Mastercard gift card, and honorable mentions receive a $25 Mastercard gift card. Judging is done on a national level (not by us). Entry in the contest is voluntary and entitles Next Level and American Color Imaging unlimited use of the photography without additional compensation. $25 credit you can use toward prints, canvases, products, or packages. Additional prints, canvases, products, and packages are available for purchase. 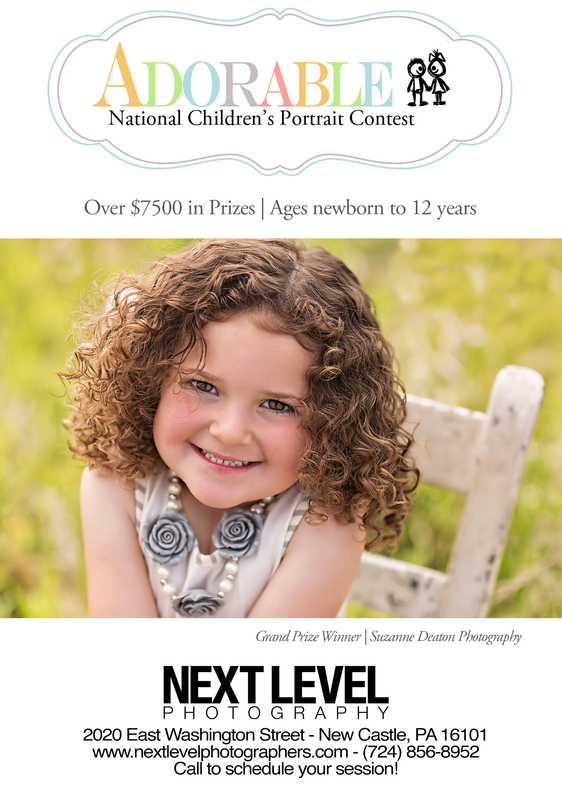 Next Level Photography, LLC is Mary Perry and Matthew Christopher of New Castle, PA. We specialize in wedding and portrait photography but have photographed everything from industrial plants to hotels, pets, products, and more. The Next Level Photo Booth is the nicest most entertaining photo booth in the area. Contact us at (724) 856-8952 to discuss any photography needs!